We’re making illusion necklaces- grab some wire, beads, and join in! Julia: Showed off a Monster Chunk, her Potter Vest and a Last Bloom headscarf. She also showed progress toward her Shawl Collared Sweater. New yarn acquisitions: Knitpicks Imagination in Ruby Slipper and Skinny Bugga! in Rose Weevil. Sue: Showed us her new ribbon belt, a beautiful chunky gem necklace and her newest horse hair jewelry designs: bangle bracelets. DIY: Using Crimp Beads. Sue taught how to use crimp beads, crimping pliers and beading wire so you can create a necklace or bracelet. Both Sue and Julia made illusion necklaces. One method of adding a clasp was demonstrated on the podcast. 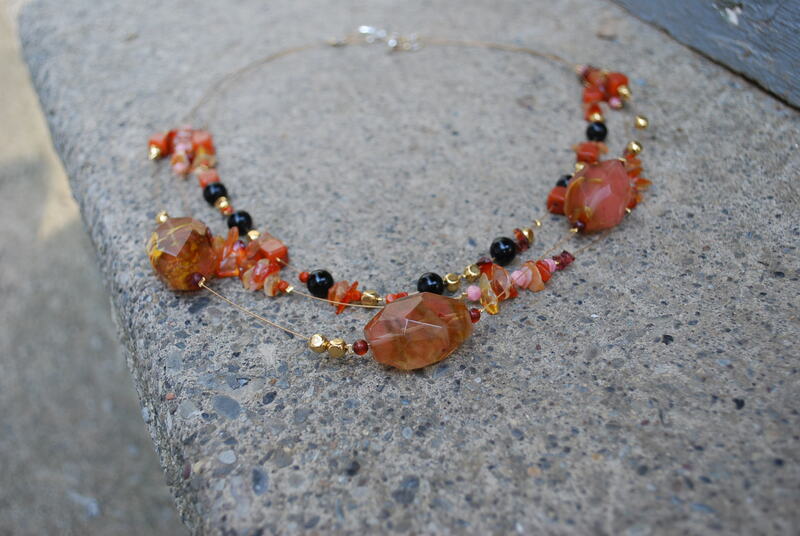 See this post on the blog for details on another ways of finishing off your illusion necklace. We love to hear from you! Please continue to visit us and leave comments/iTunes ratings.